This is a very delicious and a very simple chocolate cupcake recipe perfect for those who do not like or include eggs in their diet. It is so simple that even beginners can try this. I saw this on a television show and could not resist myself from preparing it. Since it turned out well, I am sharing it with you all. As Valentine's day is round the corner, you can make these small and cute cupcakes for your loved ones. 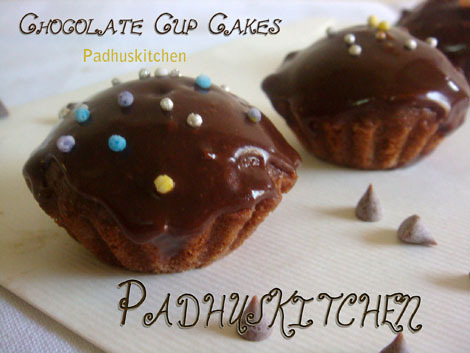 Today let us learn how to make eggless chocolate cupcakes following this easy recipe. Grease and dust the cupcake moulds. If using paper liners, you do not have to grease it. Sieve all the dry ingredients together twice. In a bowl, add oil, vinegar, sugar, vanilla essence, lukewarm milk and mix with a wooden ladle until sugar dissolves. Add the dry ingredients and fold it gently. Spoon cupcake batter into cupcake moulds or paper liners until 2/3 full. Bake at 180 degree C for 20-25 minutes or until a toothpick inserted in the center of the cake comes out clean. Cool it well before frosting. I have decorated it with chocolate sauce and sprinkles. You can use chocolate shavings or grated chocolate or even gems according to your preferences. You can refer my Walnut Brownies for the chocolate sauce recipe. yyummmmmmmm,, that sure looks out of thsi world... delicious!! I can't believe they are eggless! muffin looks so cute..n love the frosting also!! eggless chocolate cake looks delicious. wow..such a tempting cup cakes..mouthwatering.. Delicious cupcakes, nice of U to stop by my blog, first time here, you have such a wonderful space and interesting recipes, happy to follow U.. I comes from Indonesia, visiting here to support this blog. Can I substitute the essence with something else? Any ideas where I can find essence? Can I substitute the essence with something else? Hi.. I would like to try my hands on this cake recipe. I would like to know if I can use baking powder in the place of baking soda? Of course you can bake any cake in pressure cooker. Check my Vanilla Cake in Pressure cooker. Follow the same method but timings may differ as cupcakes need less time to get cooked/baked. Hi,instead of oil I added melted butter but the cake is soft but is missing . I used spoon to mix not blender is it OK.
Hii padhus ... I m not having vinegar.. can I use lemon extract ?? ?